Contains spoilers for Air Awakens. See my review here. Vhalla Yarl is a rare sorcerer. She is the only one of her kind. She is a Windwalker. Vhalla's powers make her an asset to the Empire, so when she is charged for previous crimes - she is punished by being chained to the military. The once library apprentice knows nothing of warfare, but she is given no choice in the matter. She is to leave for war soon after her trial for the Night of Wind and Fire. But she is not alone. Along the way she will find aid in friends she didn't know she had and from the Crown Prince himself. The trek across country is wrought with danger - enemies are not partial to the idea of the Solaris Empire having a Windwalker in their midst. They will do anything to stop Vhalla from reaching the war. She must do everything in her power to learn how to stay alive, even if it means facing the demons that plague her nightmares. While it would be easy to sit here and gush about just Vhalla and Aldrik - I will not do that, for the book and series is far more than the romance. I want to do this book justice in reviewing it, for the Air Awakens series is self published and requires so much love from its readers. I want everyone to know about this absurd, small and beautifully tragic series. I thought I had my absolute favorite book of 2015 pegged down, but after reading both books in quick succession, I can claim without a doubt that the Air Awakens series has stolen that spot. Fire Falling in particular was astounding. Elise Kova is a magical woman herself. I think it takes a certain extraordinary person to be able to erect such a touching and whimsical tale. Her writing is simple, yet so alluring that the pages are just that - pages. You don't find yourself looking at the page numbers as you read. If anything, I wept internally like a babe when I discovered I was nearly done with the book. You know how you try your best to savor your favorite food but end up gobbling it down? That was me with this book. I did my best to take it slow, knowing quite well it would leave me with separation anxiety when I was done with it. But, the glutton part of me just read, and read until there was nothing left. Now I must wallow away in my self pity for 11 weeks until the release of Earth's End which comes out on February 11th, 2016. Just short of Valentine's Day (PS: My Valentine's Day wish would be if you all picked up this series, it's better than chocolates and flowers I promise). I swear it's so good that I WILL vow to re-read this miraculous series one day, and I never re-read. It's so good that if I wasn't a eighteen year old hobo I would, without hesitation, purchase the $30.00 hardcopy. But alas, I must settle for the $3.00 ebook until I have a job and money. No guys seriously, $3 is less than what you pay for a coffee okay - it's cheap as dirt and worth far more if you ask me. The romance was so well done. It began as a slow burn that became a raging inferno. WHY DON'T MEN LIKE ALDRIK ACTUALLY EXIST?! Please note I said MAN because whoof, Aldrik is a chivalrous, snarky, broken and strange man who I need in my life. He's my ultimate book boyfriend, everyone else before he can't possibly compete. Sorry loves, but there's no way. He's every YA boyfriend balled up into one to create the ultimate man. The characters are honesty what make the story so great. Vhalla is a strong female character - but she has her weaknesses. She can be broken. Aldrik, the Fire Lord can be broken. Nobody here is safe. They are completely HUMAN. They are fleshed out in a way that makes you feel everything that courses between them. Every pain, every rejoice of happiness is like your own. Larel and Fritz, Daniel and Craig; while they are secondary characters they have their own voices which add an extra layer to the series. I think what I love best with how Elise writes is that everything has a purpose. There are no senseless bits - you know she's lining up the dominoes, you just have to wait until one is pushed over in order for the rest to fall down. Read this series. If you ever listen to anything I say, I implore to you that these books are well worth purchasing and reading. The first was a diamond in the rough, but Fire Falling was a earth shattering experience. I only regret not reading these sooner. Read it for the magic, the fantasy, the friendship, the romance. Read it even if you think it's not your thing. Take it from someone who used to hate fantasy, this book, in my opinion can be anyones books. It has everything a book needs in order to be brilliant and lovely. The cliffhanger is a kick in the feels, but it so worth the pain. 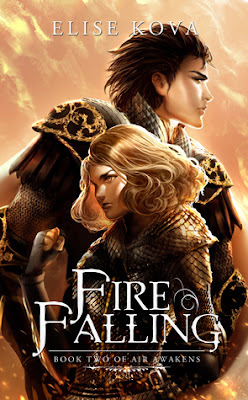 Kynndra is currently reading A Clash of Kings by George R. R. Martin and wallowing over the ending of Fire Falling because it tore her heart to shreds. Seriously. It feels like I'm the only one who hasn't read these books yet. I'm definitely putting it on my Christmas wish list! I can't wait to read this series!!! My boyfriend pretty much hinted he's getting book one and two for me for Christmas. I'm counting down the days! Haha .. wow, so you loved it? ;) I already have the first book on my wishlist, so I'm part way there. Wow, glad you loved these so much! They do sound really good and yay or a self-published novel that is worth reading! They seem rare sometimes. They are VERY good c: Oh I know, it's hard to find some genuinely great self published books, but the Air Awakens series is a winner! YAAAS KEIONDA, YOU DEF' NEED THIS BOOK RIGHT NOW. I am soo happy I was able to introduce you to this wonderful series. I really hope you can read it soon (it's well worth it!). ASDFGHK don't get me started on my new boo. ALdrik is everything I desire lmao. The character + the story are golden. I like the romance, would love to read this book. Excellent review! Romance in the Air Awakens series is beautiful, Choki. Can't wait for you to read it. Thanks! The Tattooed Heart... Fear the Messenger!